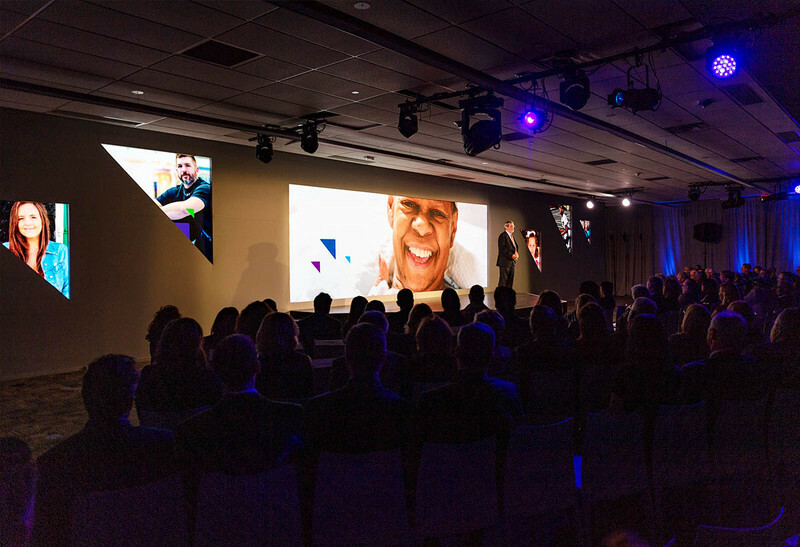 Iraq War veteran and Northwell Health patient Dustin Kirby and Northwell’s President and CEO Michael Dowling closed an inspiring program of innovation during the Outpacing the Impossible launch event, which announced Northwell's $1B fundraising campaign. 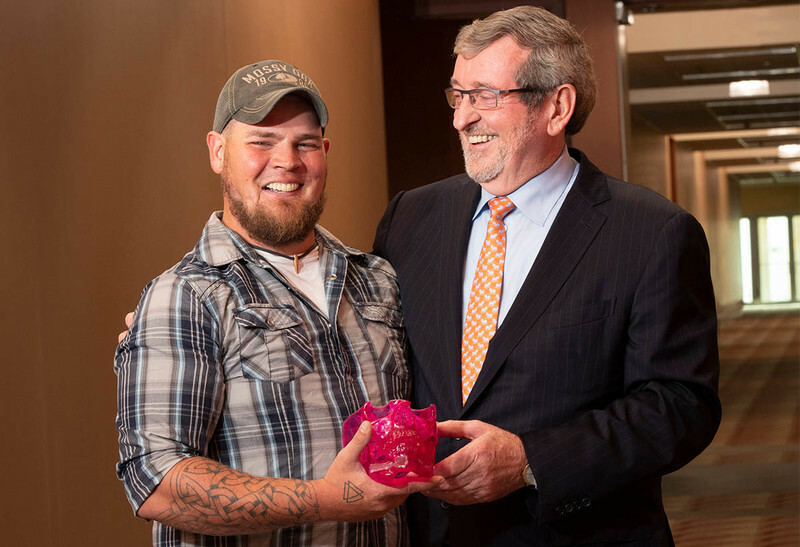 Dustin “Doc” Kirby, a U.S. Navy Corpsman and Iraq War veteran, shared his jarring journey of perseverance at the public launch of Outpacing the Impossible, The Northwell Campaign, at Northwell’s Center for Advanced Medicine in Lake Success. The event brought together more than 500 of the organization’s visionary benefactors who support hospitals, research and programs across the health system’s footprint. The event served as the launch of the public phase of our first system-wide, comprehensive fundraising campaign, an ambitious $1 billion effort to support our promise to the people we serve. This campaign will help propel innovations to advance health care. 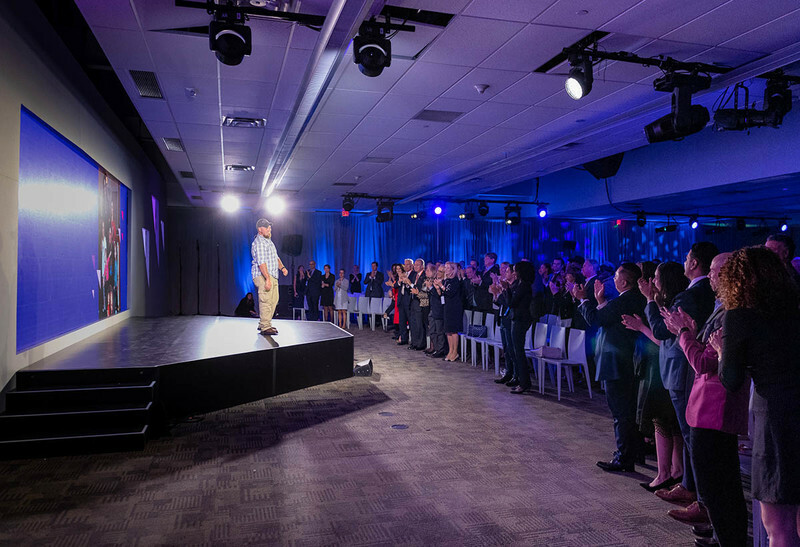 The crowd giving Dustin Kirby a standing ovation after sharing his story at the Northwell Health Campaign Launch Event. Outpacing the Impossible supports capital projects, improves hospitals and clinical programs, advances research and funds endowment for teaching and research initiatives. A significant portion of the campaign will also be allocated to the development of Northwell’s care locations in Manhattan. Northwell Health comprises 23 hospitals and more than 665 outpatient care locations throughout the New York metropolitan area and beyond. 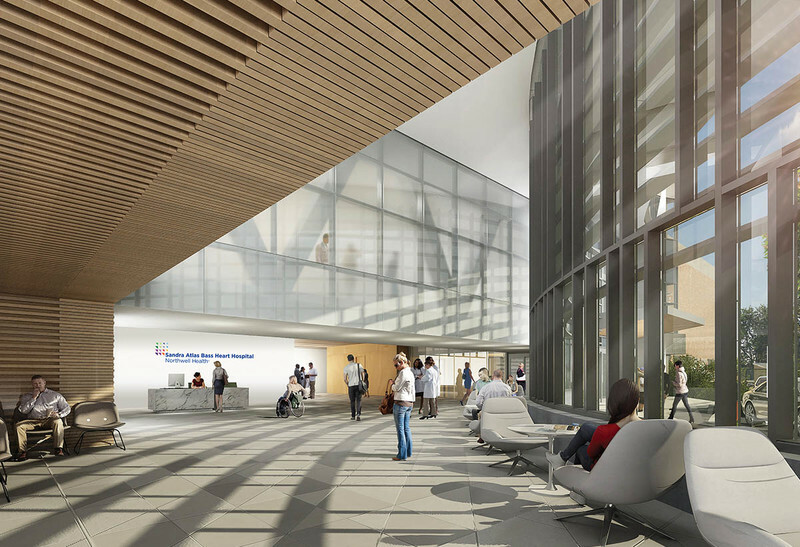 A rendering of North Shore University Hospital’s proposed Petrocelli Pavilion. It is among the projects and programs that will be supported by Outpacing the Impossible. 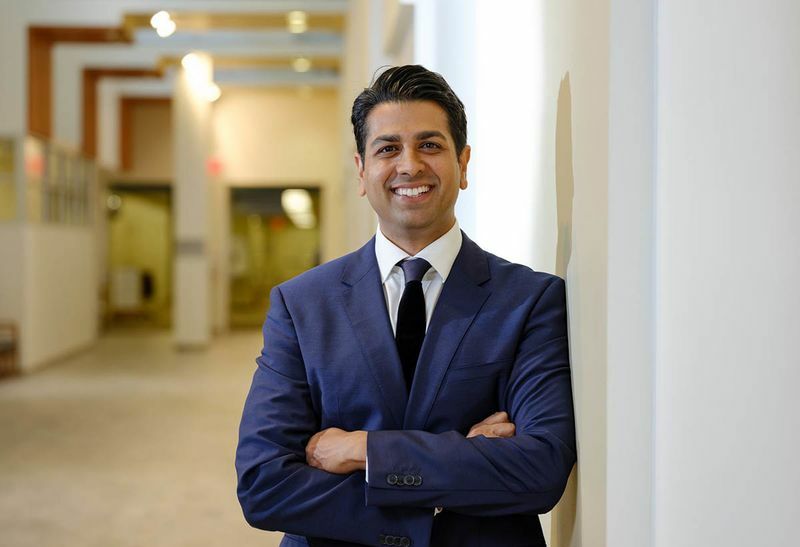 This campaign includes all funds given by more than 63,000 individual donors, corporations and foundations during the campaign’s “quiet phase.” In the campaign to date, donors to Northwell have given nearly $500 million. As part of Outpacing the Impossible, Northwell is also launching its first enterprise-wide employee giving program, inviting staff among all levels throughout our organization to participate. More than 5,000 employees have already given more than $7 million to support projects and programs across the health system. This campaign will fuel innovation in strategic areas, including research, pediatrics, women’s health, behavioral health and military veterans programs. Every gift to Outpacing the Impossible accelerates potential cures and helps us find answers and create treatments and therapies that strengthen our local communities. Leonard Feinstein, William Mack and Roy Zuckerberg — all longtime benefactors to Northwell — are co-chairs of the Outpacing the Impossible campaign. It’s also being led by a campaign committee, comprising significant donors, prominent volunteer community leaders and Northwell leadership. Our mission begins with our patients and families who have come to expect the unexpected from us. 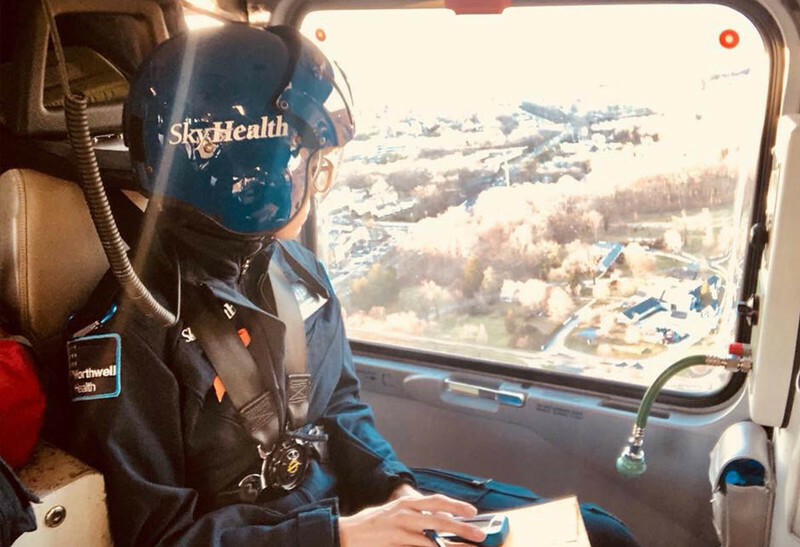 Outpacing the Impossible rests on four pillars that define Northwell’s culture — driven to discover, disruptive thinking, pioneering solutions and seeing people fully. “We believe in the power and potential impact of taking on challenges and going where others won’t,” says Northwell Health President and CEO Michael Dowling. Innovation fuels advancement in health care, and at Northwell, philanthropy fuels innovation. The increasing costs of healthcare delivery, combined with declining and delayed government and insurance reimbursements for delivered care, create the perfect storm of challenges that confront our ability to advance medicine, pioneer real-time care solutions and deliver the right care at the right time. This is the moment your gifts help save lives by bringing our breakthroughs to life. We will be the reason every researcher, clinician and innovator looks at health care differently — and decides to act. Together, we embody the incredible momentum that will help us outpace the impossible. Over the last three years, Northwell Health has seen exponential growth of our philanthropic support, further accelerating our ability to deliver on our mission. Thanks to our generous donors, we had a record year in 2017, receiving more than $177.3 million for our hospitals and programs. Every story of lifesaving work — every radically new idea, venture pursued and impact on people’s lives — is only as real and as effective as the ability of the communities we serve — and their willingness — to support it. Learn more about how Northwell is Outpacing the Impossible.